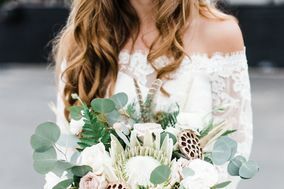 One of my best memories of my wedding day was my first look at my bridal bouquet--my heart fluttered and breath shorted, I was stunned by the sheer beauty of a dream turned reality. It was a perfect bouquet, and it was mine! From the beginning, Maria at Moonlight Iris made everything easy. Through Pinterest boards and consultations she guided me through the decision making process, got to know me as a bride, really listened to my desires and translated them into floral design. Her professionalism paired with an easy going attitude helped alleviate some of my bridal stress. I gave Maria creative liberties and she did not disappoint. What Moonlight Iris delivered was high quality, personalized, unique, beautiful, fresh--far beyond my expectations. 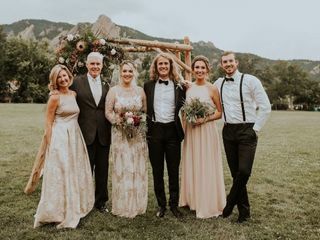 All of the floral arrangements filled the wedding with warmth, vibrancy, intrigue, and rustic elegance. Maria, you captured my vision in a vase! Beautiful florals; just as we discussed! Maria was fantastic. From the moment we first chatted, she dug in to understand our vision and work/help us keep in line with our thinking, while being creative and on-budget. The result was gorgeous florals on our wedding day! Because our venue and mountain backdrop was so dramatic, we really did not need to add much to the ceremony or reception space, but the classic greenery mixed with white flowers added the perfect amount of softness, scent, and beauty to the day. Aside from this, her setup was SO fast and I loved that Maria was able to weave in tablescape design - and bring the candles/votives - to make it truly a one-stop-shop. I would recommend her services without hesitation!!!! Maria was simply wonderful! She was always professional and her talent spoke for itself. Being an artist myself I found myself trying to over complicate things and eventually I just told Maria “these are my colors and preferred flowers- go to town.” And she did not disappoint! She was collaborative, timely and very respectful of my budget. She was a joy to work with and I couldn’t recommend her enough! Maria is an amazing florist and person and we were so happy with went with her for our wedding flowers! She instantly was in tune with my vision when it came to flowers and had ample suggestions and visual examples when I needed suggestions. She is super sweet and kind, and was very responsive via text, phone call, and email. Our flowers were amazing and I am going to try to preserve my bouquet forever. She made beautiful bouquets, corsages, boutonnieres, flower crowns for our flower girls, aisle markers, and cake arrangements. When we had to move our wedding inside last minute because of rain, she rearranged the arbor florals into these gorgeous vertical flower arrangements! I highly recommend Maria if you need florals for any event. Her prices are more than reasonable and she is a truly talented artist. I wanted the flowers for my wedding to be simple, natural, and simultaneously attention grabbing and stunning. Maria was able to pull off that vision perfectly. Without even needing to see mock-ups, I trusted Maria to bring my vision to life and she did! I got so many compliments on the flowers and decor she pulled together which ranged from simple greenery table ties. to a beautiful garland over the mantle and flower arrangement on the cross that was our ceremony's backdrop! In all of our communication Maria was kind, encouraging, and professional! I'd recommend her to anyone wanting to create a beautiful, natural look for their wedding florals! Maria was amazing to work with! From the our very first meeting it felt like she understood my vision for flowers and was so knowledgeable about her craft! I do not know that much about flowers so I just showed her pictures of what I wanted and she was able to recreate it with her own twist and they turned out beautifully! She was also so responsive to emails and questions and made our wedding so beautiful while also staying within our budget! They did an amazing job with our wedding flowers!! I’d highly recommend her! Maria is awesome! She worked with us every step of the way and delivered a fantastic floral display on our big day! Maria was an absolute gem. When my DIY floral expectations went awry because of my work schedule, I found pictures of her arrangements here and figured she'd be way above my budget. Fortunately she worked completely within in it! She had no minimum or maximum. She was always responsive and put up with me trying to plan with her internationally; I never knew how excited I was going to feel to see the flowers/reception designs and how much of a dream was created when all was said and done. I feel she really went above and beyond and didn't even mind when I realized only a couple days before the wedding that we needed to add a few more boutonnieres. You won't regret working with this sweet boss lady! Everything was so beautiful and all of our guests said it was breathtaking. Maria saw my vision the second I started explaining it to her. Flowers have never made me cry...that is until I saw my wedding bouquet. Beyond happy that she helped make our wedding as beautiful as it was. Maria was fantastic! We were doing a destination wedding (4 month engagement) and everything she did exceeded our expectations! I loved working with Maria! I HIGHLY recommend her. Her prices were totally reasonable and I got compliments on the flowers all night. On my wedding day she tweaked everything to make sure I was completely happy. I knew she was going to take care of me and felt total relief when she was around. We had the best experience ever with Moonlight Iris Floral! She put together everything we envisioned perfectly and we wouldn't of changed a thing. We would recommend her to any person for future weddings! She truly helped to make our dream come true! Maria was so great to work with! We met with a few florists for our wedding, and Maria was the only one who knew our vision right away. She's flexible and professional, and our flowers were absolutely beautiful! Maria and her team were a perfect choice for my wedding. As planning went on we found we had to change the venue for the ceremony and she made the transition seamlessly. I would definitely recommend Moonlight Iris Flowers for any event that you want to make more beautiful with flowers. She also has several containers, vases and lanterns that you can use for the event. 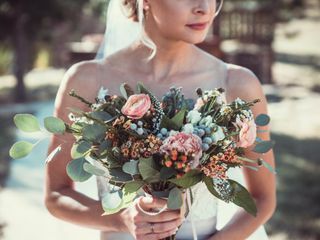 If you're looking to check flowers off that long wedding to do list, look no further than Moonlight iris florist. There was no buyers remorse and the moment I hired Maria, I had a huge weight lifted off my shoulders. Maria made me feel at ease knowing everything would be taken care of and everything would show up on time and exactly how I wanted it. The work she does is outstanding! She will work with you and figure out exactly what you want so you can incorporate that personal touch. Maria goes through the entire planning process with you and even mentioned things I never thought of. She was extremely flexible as I added last minute items probably 3 times and was happy to add them to my order. Thank you Maria for all your hard work and extra special attention to my arrangements. They were exactly what I wanted and more. Maria was an absolute pleasure to work with! She was a great listener, easy to communicate with, made suggestions based on the budget, and went above and beyond the day of to make our wedding day run smoothly (even in the snow she made multiple stops to make sure everyone had what they needed for pictures!). We rented lanterns as centerpieces and they were even better than my expectations. A week later, the flowers still look beautiful! Moonlight Iris also did the flowers for my bridal shower and now with two events down there is no one else I would go to! Both events (bridal shower & wedding) went off without a hitch and everyone should work with this company (and Maria) because she really is the best! Most bang for your buck and the flower designs are more beautiful than you could dream of! Maria was absolutely wonderful to work with. She always responded quickly to texts and emails and was very accommodating overall. She is so artistic and creative when it comes to her arrangements, you are truly in the hands of an expert. 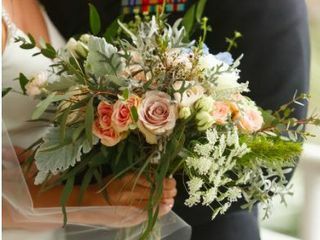 We would recommend Maria to anyone looking for a great florist and will definitely hire her again. Thanks for a wonderful experience Maria! I can't believe how amazing my flowers were with how little direction I gave! Maria knew my vision and I loved everything from the bouquet to the boutonnieres for the ring bearers. The flowers and colors were so beautiful and I'm beyond happy with Moonlight Iris and the entire process with them! Thank you for making my day amazing! Moonlight Iris did an amazing job for my wedding! Everyone said how beautiful my flowers were. They were so easy to work with and communicated very well. I would recommend them to anyone that wants quality flowers! Chose Moonlight Iris! She has a special flare & is very motivated to provide everything your heart desires. Maria was professional and personable. She added her own special flare! I'm most appreciative and the flowers were beautiful. Maria Gunn created the most stunning flowers for my wedding, better than anything that I ever could have dreamed up. She took my favorite flowers, a little Pinterest inspiration, and crafted the most dreamy, perfect flowers that I just can't get enough of! I only wish I could keep them forever!!! She is a true artist and so professional and made the entire experience so easy for me, flawlessly executed and right on time!